Erect a fence to protect our border! Don’t fret. Your West Coast Oenophile hasn’t turned xenophobic. 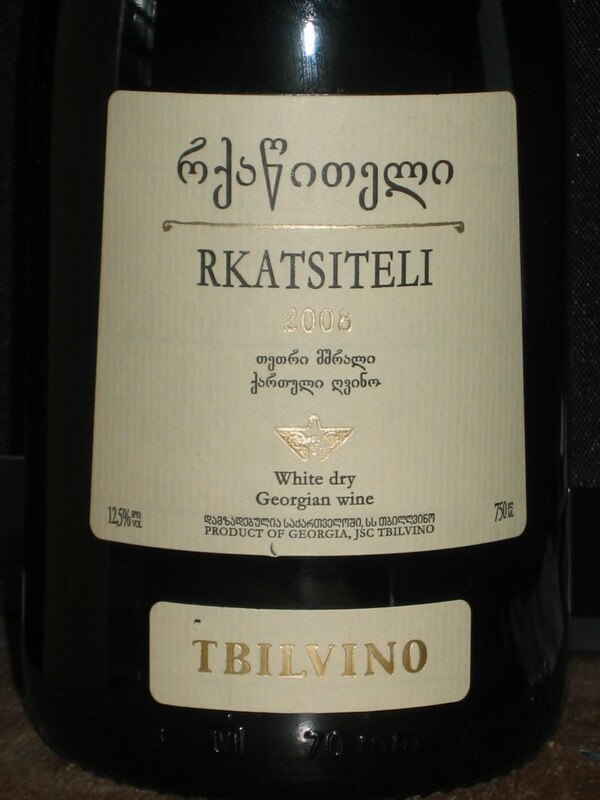 It just seems that Sostevinobile might have to ratchet things up a notch or two to stifle the insidious infiltration of foreign wine into the West Coast. Not the stuff they vint in Italy or France or Spain—or even esoteric bottlings from Moldavia or Bulgaria—but from places like Georgia. Obscurant linguists aptly think of Georgia as საქართველო, the jewel of the Caucasus, known classically as Colchis, the land from where Jason purloined the Golden Fleece. Centuries later, this former Soviet republic gave the world იოსებ ბესარიონის ძე ჯუღაშვილი (Josef Stalin), while œnophiles recognize it as home to the renowned varietal რქაწითელი (Rkatsiteli), and, reputedly, viticulture itself. However, I am referring to the Georgia-on-My-Mind Peach State, along with the other 44 non-Pacific states seeking to export their viticultural pretenses into our highly esteemed realm. There are myriad reasons Sostevinobile precludes wines from beyond the boundaries we have established. As befits our ecological entomology, we have established a defined radius for not only our wines but the entire roster of sustainably grown and locally produced foods we will source. But beyond this arguably political stance is an abiding belief in the quality of the wines and the breadth of selection we have available here, a belief evolved over 32 years of intimate involvement in the wine industry. It took the better part of nearly three decades for me to acknowledge the viticultural strides made in Washington and Oregon as a fluid continuum of the extraordinary evolution the industry has undergone here, but with only occasional exceptions, the other American Vititcultural Areas lag incrementally behind us. Admittedly, I haven’t had the temerity to try the 2010 Frogtown Cellars Bravado, a US Georgian SuperTuscan Debra Parker Wong and Joe Roberts recently extolled. I have downed a few glasses of New Mexico’s Gruet in my time, heard the praises of Dr. Konstantin Frank’s Finger Lake Rieslings, and have watched as Virginia quietly (White House gatecrashers and Donald Trump’s bombast aside) stakes a claim for viticultural ascendancy (after all, they have most planted acreage of Rkatsiteli in the US). But these scattered pockets of distinction still do not warrant inclusion as peers with the predominant excellence found here on the West Coast. Earlier this season, I attended a most intriguing tasting, sponsored by Institute of Masters of Wine. This self-poured retrospective of 45 Bordeaux-style reds from the 2010 and 2011 vintages highlighted 20 AVAs from California and 5 AVAs from Washington, along with the anomalous inclusion of wines from Grand Valley, CO; Long Island, NY; and Barboursville, VA. Apart from political expediency, the overarching attempt to brand these wines as American Cabernet proved utterly incongruous, these satellite regions barely approaching what would be considered adequacy here on the West Coast. N’importa! Others may persist in such misguided attempts at homogeneity. Sostevinobile remains resolute in maintaining its fidelity to the integrity of West Coast viticulture. Many times over, this guiding tenet was validated by the numerous highly impressive wines offered here, starting with an extraordinary 2010 Reserve Cabernet Sauvignon from Daou, one of the pinnacles of Paso Robles’ ascendancy. Rivaling the splendors of this wine, Calistoga’s Maybach dazzled with its uniquely named 2010 Amoenus Cabernet Sauvignon, as luxuriant a bottling as the cars crafted under its eponymous line. No surprise the 2010 Cabernet Sauvignon Napa Valley my friend Naoko Dalle Valle showcased stood on par with these first two wines, while the sometimes fluctuating quality of Beaulieu Vineyards’ flagship label, the 2010 Georges de Latour Private Reserve, returned to its zenith with this outstanding release. I certainly would have expected a wine of this caliber from Cathy Corison, and the 2010 Cabernet Sauvignon Kronos Vineyard did not disappoint. Somewhat verging from the rest of the field, Joseph Phelps’ eponymous label elected to feature a retrospective from the previous decade, the 2005 Insignia, his last official bottling. Not surprisingly, most of the wineries shied away from showcasing their 2011 vintage—an erratic vintage at best—and opted for the more consistent 2010. As such, Continuum Estate’s 2011 Continuum Pritchard Hill, a deft blend of 75% Cabernet Sauvignon, 12% Petit Verdot, 11% Cabernet Franc, and 2% Merlot, proved an out-of worldly (though not quite Martian) wine that consolidated Tim Mondavi’s claim to his father’s mantle. Another Napa legacy, Rosemary Cakebread, similarly proved a worthy heir to her family’s renown with the 2010 Cabernet Sauvignon Napa Valley from her proprietary Gallica label. When I began my wine career in the early 1980s, Chenin Blanc was ubiquitous trhoughout the Napa Valley. It now seems an anomaly that Ballentine Vineyards still produces a rendition, albeit one that attained Top 100 Wine status in Wine Enthusiast. Still, their old school approach led to an unexpected pleasure in discovering their 2010 Cabernet Sauvignon Reserve among the highest tier poured this day. Thirty years ago, I had a peripheral role in the first acquisition of Château St. Jean, then a winery that only produced white wines; here, this Sonoma landmark continued to hold its own with the Napa titans with its storied 2010 Cinq Cépages (its 1996 vintage was proclaimed Wine of the Year by Wine Spectator in 1999). Cinq Cépages’ first winemaker, Richard Arrowood, went on to found his own eponymous label, before establishing his current venture, Amapola Creek. His touch, however, manifested itself quite distinctively in the 2008 Cabernet Sauvignon Réserve Spéciale Arrowood Vineyards featured here, a wine that neared the excellence of the St. Jean. Other veteran winemakers who predate my involvement excelling here included Angwin’s Robert Foley, with his spectacular 2010 Cabernet Napa Valley and, of course, the much-heralded Paul Draper from Ridge, whose 1997 Monte Bello validated the endurance of this spectacular vintage. Also from that year, Heitz Wine Cellars poured its astounding 1997 Martha’s Vineyard Cabernet Sauvignon . In contrast, a relatively recent wine label. Michael Polenske’s Blackbird, impressed with its 2010 Contrarian Proprietary Red Wine a deft blend of 48% Cabernet Sauvignon, 32% Cabernet Franc and 20% Merlot. Others random selections garnering equal accolades included the 2009 M5 Cabernet Sauvignon Stagecoach Vineyards from Atlas Peak’s Krupp Brothers, Trefethen’s 2010 Reserve Cabernet Oak Knoll District, and from Beaulieu Vineyards former Director of Winemaking Joel Aiken, a superb 2010 Cabernet Sauvignon Rutherford. Several of Napa’s more redoubtable wineries made notable showings, among which were Staglin Family Vineyard, with their 2009 Cabernet Sauvignon Rutherford; Darioush with their 2011 Signature Cabernet Sauvignon, and Merlot pioneer Keenan, with their 2011 35th Anniversary Cabernet Sauvignon. Agustin Huneeus also featured selections from his designate labels, with its 2011 Faust outpointing the more vaunted 2011 Quintessa, a wine that has steadfastly excelled during more benevolent vintages, while his former protégé Bettina Sichel’s Laurel Glen radiated with its 2010 Cabernet Sauvignon Sonoma Mountain. Impressively, Jackson Family Wines attained this plateau with four of its varietal-focused labels: the 2010 Cabernet Sauvignon Mt. Veeder from Lokoya, their Cardinale 2010 Cabernet Sauvignon, and the Mt. Brave 2010 Cabernet Sauvignon Mt. Veeder, along with their Anakota 2009 Helena Dakota Cabernet Sauvignon from Sonoma’s Knights Valley. Readers here know that I am generally wary of labels that become absorbed by the large conglomerates. Nevertheless, those that are given their autonomy after acquisition often maintain the integrity of their label’s brand. Here, Diageo’s Stags’ Leap Winery, Carl Doumani’s former hallmark dazzled with the still-way-young 2010 The Leap, an amazing expression of the district. The oft-sold Beringer, a proverbial pingpong ball in the ongoing Treasury Wine Estates saga, still managed to maintain its historical stature with a profound, aromatic 2010 Cabernet Sauvignon Private Reserve, the current vintage of its landmark bottling that Wine Spectator named Wine of the Year in 1990. Pine Ridge, the crown jewel in Crimson Wine Group’s small but growing conglomerate, proved its worth with its 2012 Cabernet Sauvignon Napa Valley, a pan-AVA blend from its select Stags Leap District, Oakville and Rutherford vineyards. With a heritage that extends back to 1876, Constellation’s Simi Winery managed to uphold its venerable distinction with its 2009 Reserve Cabernet Sauvignon Alexander Valley. With prominent holdings in both California (Conn Creek, Villa Mt. Eden, Stag’s Leap Wine Cellars) and Oregon (Erath), the Columbia Valley’s Château Ste. Michelle has blossomed into one of the West Coast’s major wine conglomerate (actually, a subsidiary within an even larger international conglomerate) in its own right, yet still manages to distinguish itself under its originating Washington label with its 2011 Cold Creek Cabernet Sauvignon Columbia Valley. Washington’s acclaimed Horse Heaven Hills boasted a superb 2008 Cabernet Sauvignon Reserve from Boudreaux Cellars, while the Red Mountain AVA featured DeLille Cellars’ 2011 Cabernet Sauvignon Four Flags. The Walla Walla Valley was well represented here, starting with the 2011 Cabernet Sauvignon from Amavi Cellars. This tasting afforded me my first opportunity to sample the Washington’s esteemed Leonetti Cellar, but I felt their 2011 Cabernet Sauvignon, despite hints of excellence, was far from ready at this stage. Fortifying my contention, their next door neighbor, Drew Bledsoe’s Doubleback radiated with its 2010 Cabernet Sauvignon Walla Walla Valley. My final discovery of the afternoon was a serendipitous tasting of the 2010 Big Papa Old Block Cabernet Sauvignon from EFESTĒ in the Yakima Valley. All in all, this American Cabernet Tasting underscored how Washington’s five AVAs kept stride with the more heralded regions of California (I suspect, if a similar tasting of Merlots were held, our northern neighbor would dominate). The wines from Colorado, Virginia and New York did not even approach this level of quality or complexity. Other tastings I have attended have amply demonstrated a deepening parity between California and Oregon for Burgundian varietals, particularly Pinot Noir, while both Washington and Oregon have produced a number of exceptional varietals that have not gained a foothold here. Still, little argument can be made that the wines of the other 47 states approach the quality the West Coast produces; attempts to incorporate the viticultural axis on which Sostevinobile continues to focus into the more generic category of American wine can only dilute our reputation. Speaking of Pinot, a number of contemporary wineries feel my longitudinal demarcation isn’t restrictive enough. Once again, I was happy to make my way to north to participate in this year’s West of West, the annual festival highlighting the close-knit group of West Sonoma winemakers redefining cold climate Pinot Noir, Chardonnay and Syrah in California. Returning to The Barlow, Sebastopol’s sprawling, state-of-the-art, sustainable complex dedicated to winemakers, food producers and artisans, this close-knit collective shares not only a camaraderie but a collective passion for more restrained, expressive wines (not coincidentally, many of the labels poured here are also mainstays of In Pursuit of Balance). Given this overlap, only a few participants had not previously poured at events Sostevinobile regularly attends. Still, I was pleased to discover Jan Holtermann’s Alma Fria, whose wines focus on fruit from his eponymous vineyard in Annapolis. Heralding from three generations of wine importers, Jan’s current venture showed a seasoned sophistication with these inaugural releases, particularly the single vineyard 2012 Doña Margarita Vineyard Pinot Noir and the 2012 Holtermann Vineyard Pinot Noir. Quite amiable, though not quite as distinctive, were their broader-ranged 2012 Pinot Noir Sonoma Coast and a 2012 Chardonnay Sonoma Coast. Also debuting their wine: Senses, a new collaboration from Occidental natives and childhood buddies Chris Strieter, Max Thieriot, and Myles Lawrence-Briggs. True to form, winemaker Thomas Rivers Brown blended grapes from both Hillcrest and B. A. Thieriot Vineyards to produce an exceptional 2012 Chardonnay Sonoma Coast, alongside a textbook 2012 Pinot Noir Sonoma Coast. I would be hard pressed to find a wine that I found unremarkable among the ardent, studious collective pouring here, but several of the perennial participants came through with truly exceptional vintages. Two of the most impressive came from my prep school colleague Steve Singer’s Baker Lane: the 2012 Sonoma Coast Cuvée Pinot Noir and his exceptional signature bottling, the 2012 Estate Syrah. Other friends from my East Coast upbringing, Benziger Family Winery, dazzled with their 2012 de Coelo Terra Neuma Pinot Noir, while peripatetic winemaker Ryan Zepaltas proved his mettle with his truly extraordinary 2012 Devoto Terra Neuma Pinot Noir. Echoing Benziger’s devotion to environmental stewardship, Cerritas showcased an organically farmed 2012 Porter Bass Vineyard Chardonnay.The paradoxically named Small Vines also garnered enormous appeal for its profound 2012 Chardonnay Sonoma Coast. I typically associate DuMol with Chardonnay, as well, but here their standout proved to be the 2012 Aidan Wild Rose Vineyard Pinot Noir. While simultaneously managing Vinify, the Santa Rosa custom crush facility where many of the West of West vintages are produced, Justin and Hillary Lattanzio produce an understated eponymous label, here with their 2012 Umino Vineyard Pinot Noir redolent of an impressive pedigree honed under Heidi Barrett and Wells Guthrie. Another winemaker esteemed for his Cabernets, David Ramey, displayed his Burgundian forte with the 2012 Platt Vineyard Pinot Noir. Mirroring Ramey, Sebastopol’s Red Car also excelled with their own rendition of the 2012 Platt Vineyard Pinot Noir. A mainstay at numerous Pinot-focused tastings with both his Oregon or his Sonoma vintages, Siduri’s Adam Lee can always be relied upon for consistently outstanding wine, as evidenced here by his 2012 Pinot Noir Sonoma Coast. Some may find it hubristic to claim parity with one of Burgundy’s most esteemed producers, but Soliste’s self-referential homage to Vosne-Romanée for its marvelous 2011 Fôret Pinot Noir holds a definite degree of validity. The hallmark of this wine comes, however, comes from its triumph over an arguably vexing vintage. Across California, wines from 2012 almost uniformly proved wonderful, a vintage that made itself. But the preceding year required considerable œnological prowess to eke out a memorable wine, and a significant number of wineries chose to bypass bottling from this harvest. In addition to Soliste, several wineries pouring at West of West rose to the occasion with spectacular results, including 32 Winds, with their 2011 Lucky Well U.V. Pinot Noir. So, too, did Gros Ventre, with their salute to primogeniture, the 2011 First Born Pinot Noir. Katy Wilson augmented her LaRue’s growing reputation with the 2011 Emmaline Anne Vineyard Pinot Noir while one of The Barlow’s anchor wineries, MacPhail, displayed considerable aplomb with their 2011 Platt Vineyard Pinot Noir, a most striking predecessor to the above-mentioned latter vintage. Marimar Estate operates an offsite tasting room at The Barlow to complement their Sebastopol estate’s acclaimed Doña Margarita Vineyard. True to their renown, their 2011 Mas Cavalls Pinot Noir proved a deft blend of their allocated Pommard (63%), Dijon 115 (32%), and Dijon 667 (5%) clones. As specifically focused and equally lush: the 2011 Bodega Ridge Block Pinot Noir from John & Barbara Drady’s Sonoma Coast Vineyards. Taming the 2011 vintage was not restricted to Pinot. Ramey featured a rich 2011 Platt Vineyard Chardonnay, while Red Car’s 2011 Estate Vineyard Syrah proved utterly masterful. As I complimented one of the vineyardists here on how the West of West wineries had risen to the challenges of such an ornery year, he confided that, for these growers, 2011 had been anything but, the intense heat spikes that had felled so many other regions hadn’t affected this cold, isolated AVA. As always, the West of West provided an exceptional, highly informative tasting, one that stood apart from many of the less consistent events I have attended of late. Could argument be made that this region has risen to the point that it stands apart from the rest of the West Coast? Perhaps, but certainly there is no case for erecting a fence—just yet. This entry was posted in Cabernet Franc, Cabernet Sauvignon, Chardonnay, Merlot, Pinot Noir, Syrah, Uncategorized and tagged 32 Winds, Aiken, Alma Fria, Amavi, Anakota, Arrowood, Baker Lane, Ballentine, Banshee, Beaulieu Vineyards, Benziger, Beringer, Blackbird, Boudreaux, Cardinale, Ceritas, Château St. Jean, Château Ste. Michelle, Constellation, Continuum, Corison, Dalle Valle, Daou, Darioush, DeLille, Diageo, Doubleback, DuMol, EFESTĒ, Gallica, Gros Ventre, Heitz, Huneeus, Joseph Phelps, Keenan, Krupp Brothers, LaRue, Laurel Glen, Leonetti, Lokoya, MacPhail, Marimar, Maybach, Mt. Brave, Pine Ridge, Ramey, Red Car, Ridge, Robert Foley, Senses, Siduri, Simi, Small Vines, Soliste, Sonoma Coast, Staglin, Stags’ Leap, Trefethen, Zepaltas on December 1, 2014 by donaldmarc.